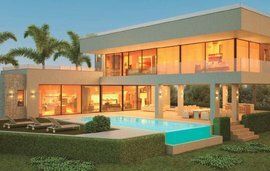 Ideally situated only 200 metres from the sea in Punta Paloma, Manilva. These apartments are only a few minutes drive from La Duquesa Port where you will find all amenities. Due to the fabulous location these properties make an exceptional holiday home. Construction will be finished by the end of May 2019 so you dont have long to wait and could enjoy your property this summer. This brand new development is set on a hilltop and therefore all of the 2 and 3 bedroom luxury apartments and penthouses have views of the Mediterranean Sea. 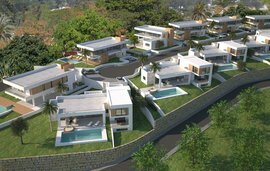 This gated community has 24 hour security and offers 2 swimming pools, gym and sauna all set in tropical gardens. The price for a typical 2 bedroom apartment starts from 252,000 and the layout is of open plan living with a good-sized lounge/dining room with access to the terrace, half of which is covered and the other uncovered so you can enjoy the outdoors either in the sun out. It also has an open plan fully fitted kitchen with NEFF appliances. The master bedroom is ensuite and has access to the terrace and the other bedroom isa los ensuite, both bedrooms have fitted wardrobes. There is also a guest toilet as well as an entrance hall. Please ask us for the layouts for 3 bedroom apartments that start from 279,000. There are underground parking spaces and storerooms included in the prices. Other features include contemporary fire places, pre-installed fibre optic, Toshiba air conditioning throughout and aerothermal heating systems as well as a 75% energy saving system on hot water.